Yesterday we were getting ready to go to the lake for the first time this season. I had my bathing suit on and grabbed some shorts. They were too tight. Ugh! I grabbed another pair and I could not even pull them up. Same with another and another. The last pair I had left, finally fit. One pair of shorts out of five! Of course tears started to flow and then I was crying. Of course I eventually dried my tears and we went to the lake anyway and had a very nice day. But I am reminded how easily I can go down that path of negative self-talk. Of course, I am not “fat”. That my size four shorts don’t currently fit does not lead to a factual conclusion that I am “fat”. My size 6 and 8 clothes do fit. Losing a lot of weight changes one’s body significantly. The changes that occur in how we see ourselves does not always keep pace with the physical change. And even if we see ourselves through a relatively undistorted lens, there often remains an intense fear of gaining the weight back. I appear to continue to struggle with both issues. Why is this such a problem? In its more serious form, this type of thinking can be related to an eating disorder and/or body dysmorphic disorder (e.g. seeing an apparently ‘normal’ part of one’s body as so disfigured, large, or ugly that one may not want to socialize or leave the house and at its worst, may lead to suicide). Thankfully, most of us do not experience these types of symptoms. 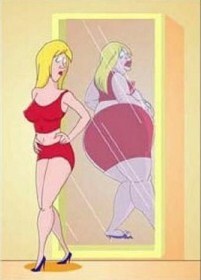 Nonetheless, countless women see themselves as overweight (when they are not). We base these beliefs, at least in part, on the images we see on television, in advertisements, and in the many women’s magazines we read. How many of my female readers bought magazines as teenagers? In fact, there are magazines that actually cater to teenagers. In my adolescence, these magazines featured thin young women in the latest styles (including string bikinis). My friends and I poured over the pages and then tried to emulate these styles and looks as best we could on our meager babysitting monies and allowances. I actually recall telling my dad that I was going on a diet (around age 13) and planned to eat something like: 6 saltines, 8 grapes, etc. Thankfully my father set me straight and I altered my diet in a more healthy manner. This distorted view of dieting came from a magazine. I am certainly not saying that weight is not important. Certainly the difference between 135 and 140 is much smaller than the difference between 135 and 210. When you are working to lose significant amounts of weight the scale should be a part of regular measurements that will allow you to see if you are progressing. Other forms of measurement should include paying attention to how your clothes fit, body measurements, and if possible body fat percentage. But the scale does not define us, it is a tool. So do I want to lose a few pounds so that the rest of my clothes fit? If my muscles stop growing and maybe even decrease in size a bit, my weight on the scale is likely to go down. 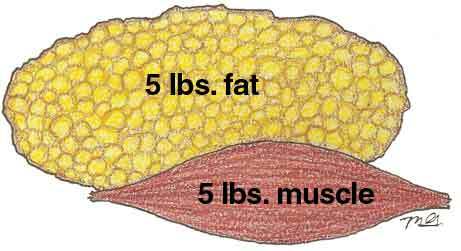 However, fat takes up more space than muscle. And I do not think my current workouts include enough fat burning cardio to prevent this from happening. So, if I set aside the shorts and the scale for now and just think about how best to keep my body healthy…can I really set aside the shorts? No, not really. And then there is the issue of my heart and upcoming surgery. What would be best for my heart? Well, cardio is obviously very good for the cardiovascular system (hint: cardio = heart). So do I make another change in my workouts, apparently, yes.